3 days remain in this extended round. I have received 10 out of 25 possible entries. The finished product was supposed to be released in 1978, however delays forced only a limited release in December 1978 with the full release being in 1979. 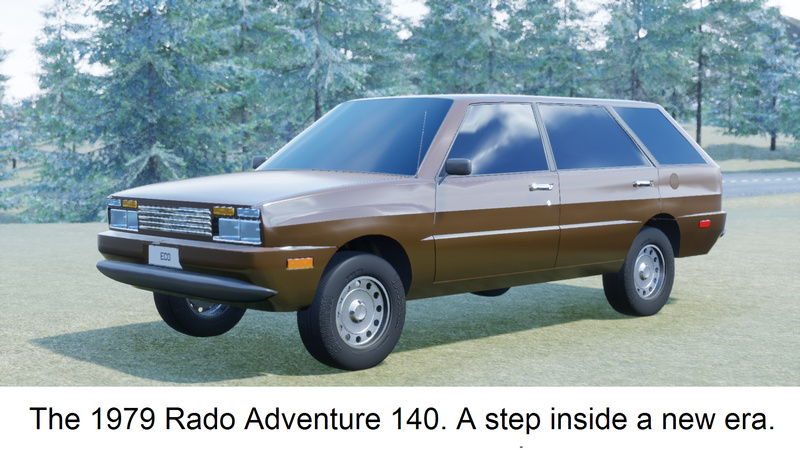 Sporting a 2.3 liter/140 ci OHV 4 cylinder engine making 73 hp and 105 lb-ft of torque, the Rado Adventure 140 would be Rado’s second attempt to enter the passenger car market. 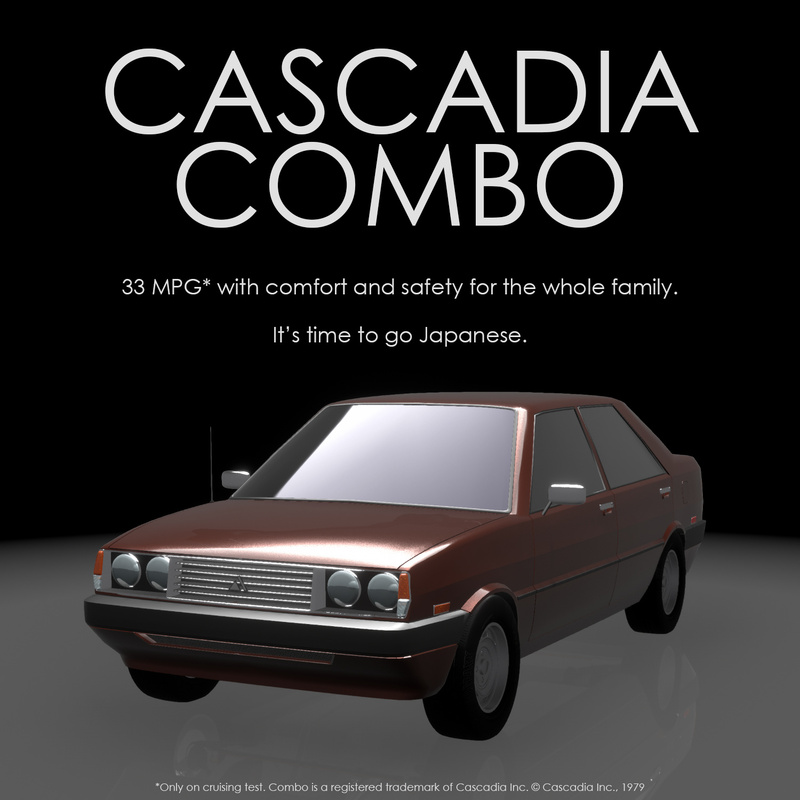 And unlike the communist import that preceded it, it actually came with a choice of trim levels, Basic and “Value”, which was really just the former with all the options added for a slightly lower price than getting all the options. It also came in a choice between RWD and 4WD. 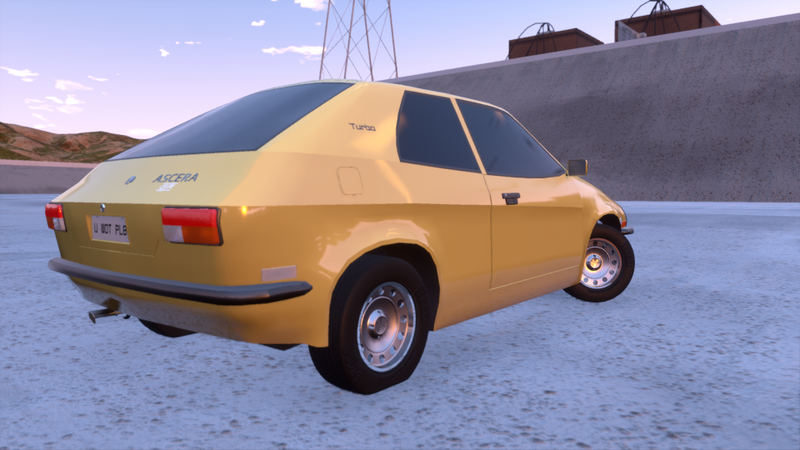 In 1979, Kimura began production of their best-selling model in the US market, the Auriga. 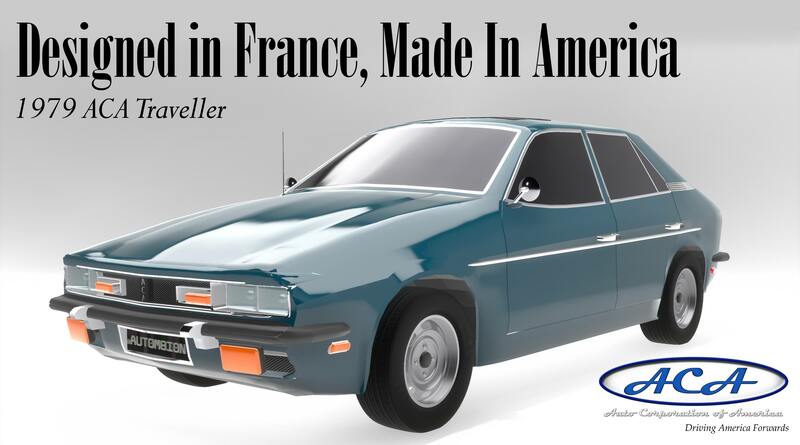 The Auriga became a new sensation in America in 1979. 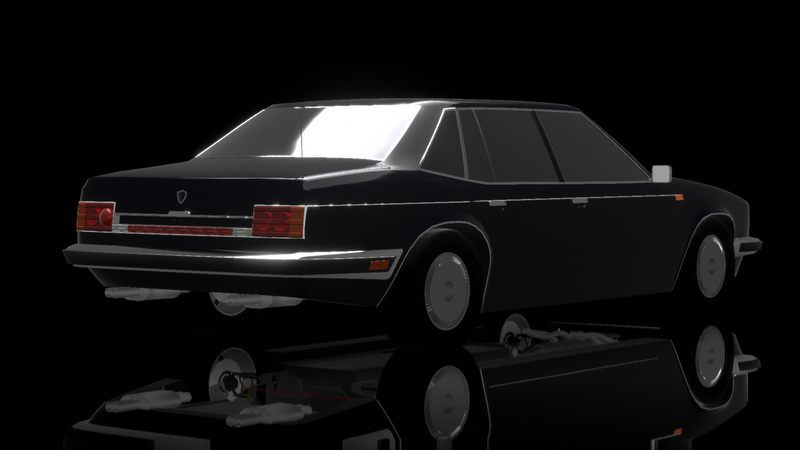 The 4-door sedan quickly became renowned for it’s tight handling and practical nature for a low price. 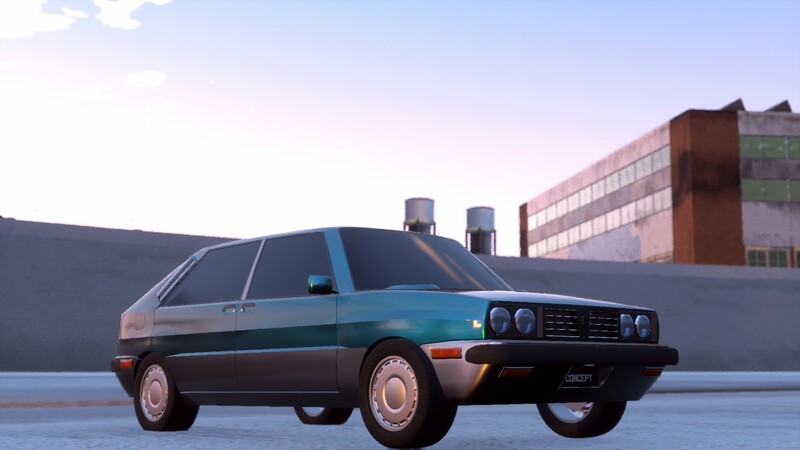 The combined sales of the Auburn and Auriga would arise a new era for Kimura: commonly known by fans as the “Ultimate Age,” from 1980 to 1995, Kimura would continue to grow vastly and develop new technologies for more obscure, small car projects, such as the TKR-C and the KR-R program. 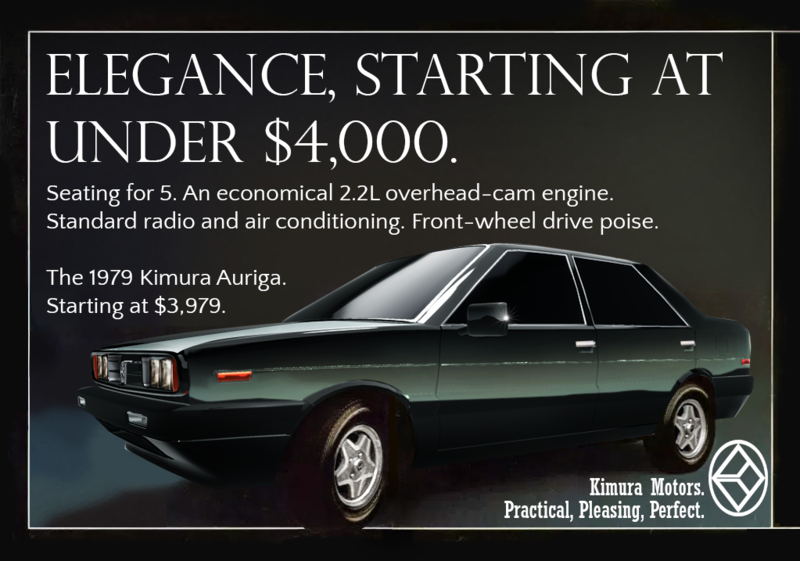 Here is an ad for the 1979 Kimura Auriga. The Baltazar-Bush Quasar. 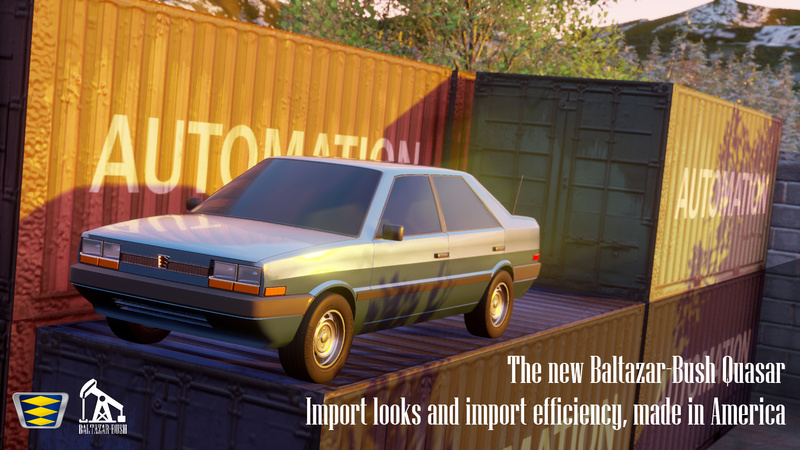 Import quality, made in America. This whole round feels so…french? 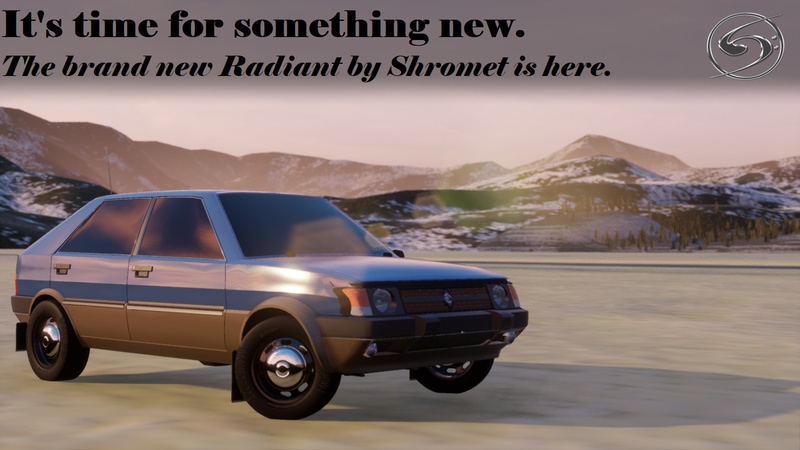 Click the Image for Lore Post. With a long history of building solid compact cars, it’s no particular wonder that Birmingham tops our list once again, this time with their 1500 XLG. 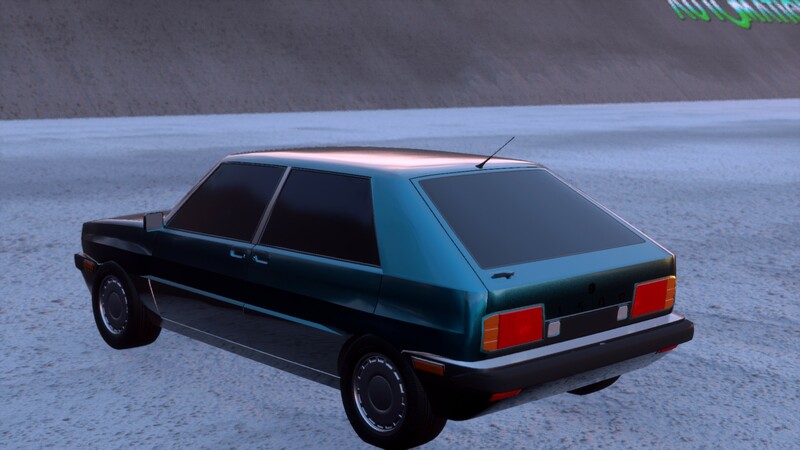 This 5-door hatchback comes with a reasonably powerful (82 HP) 2 liter four cylinder engine. Our test model was equipped with a 4-speed manual transmission, which puts down power to the front wheels. Off the line and around corners, the Birmingham gives rather sprightly performance, considering it’s geared towards the every-day driver market. Full cloth seating in all 5 positions is a welcome touch, and the AM radio also comes with an 8 track player. Sound quality is very tinny from the single dash-mounted speaker, but both radio and climate controls were easy enough to use. The 1500 XLG is priced very reasonably compared to its competition, yet gives you a lot for your money. This earns it our top spot this year. In the interest of disclosure, before our readers go any farther: Our winner this year is a toy for the elite. The likes of stockbrokers, executives, and high-power attorneys are sure to be particularly interested. 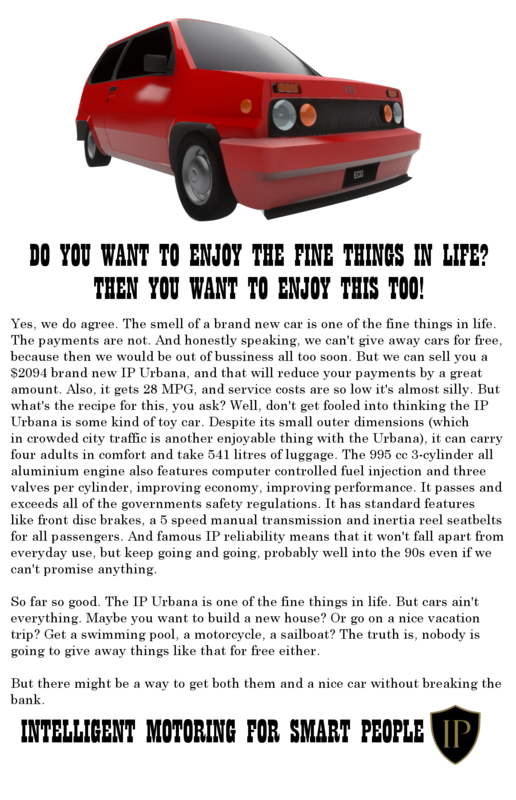 For the rest of us peasants, we can only dream of owning such a car. Erin bestowed upon this lowly editor the honor of testing their Nedala GT-12 for a short period of time. The 12 in GT-12, obviously, stands for the number of cylinders in the 5.4 liter all-aluminum motor. This amazing techno-marvel pumps out 395 horsepower, and drinks gas like I drink a Big Gulp. Fine leather trappings for four await inside, along with other touches such as power steering, windows, and central locking, a 4-speaker AM/FM 8-track player with equalizers, a lighted glove box mirror, and air conditioning. Not to mention generous amounts of real wood grain trim throughout the cabin. The ride is sublime, though as to be expected of a car the size of the Nedala, parking can be an interesting task. Then again, if you can afford a Nedala, chances are it’ll be a valet doing your parking anyway. 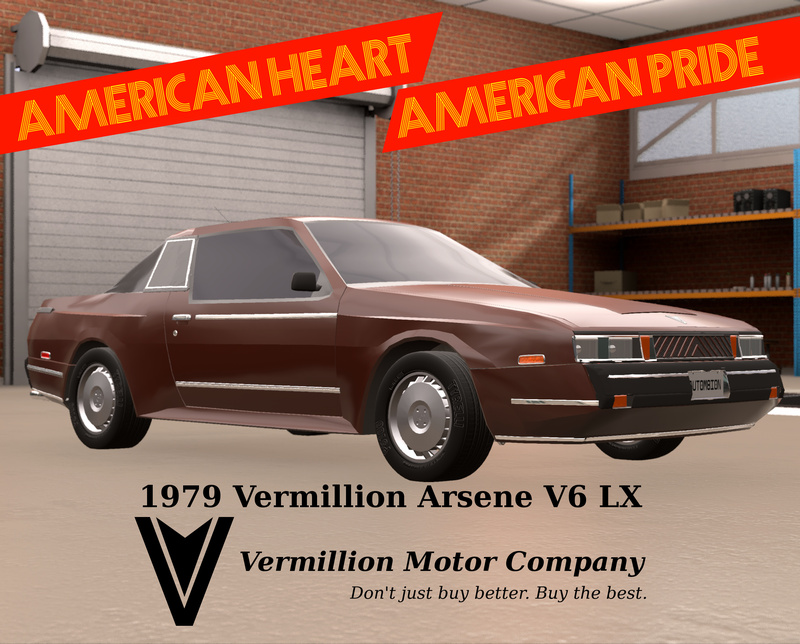 Whereas many companies try to build the ultimate sports car and lure buyers to abandon reason for a set of keys, Vermillion has taken a different approach. 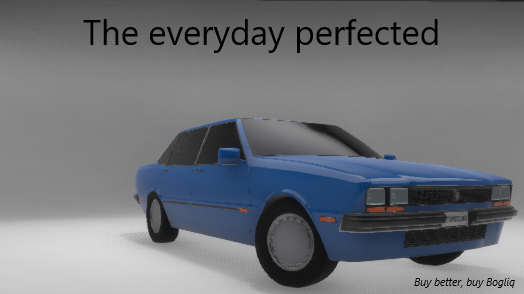 With the Arsene V6, they have an “every day” sports car. 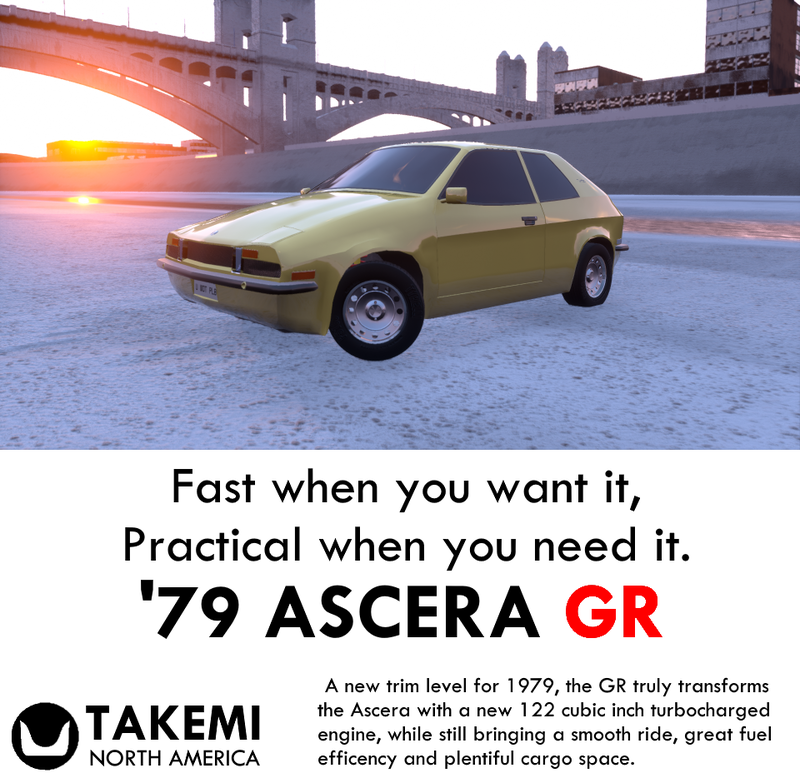 Sure, it doesn’t have the flat out speed or cornering of a TSR Kansai or Keika Katana, but it has something that they certainly don’t. Wrapping fun in a sensible package. If you really want, the fuel-injected 3.4 liter v6 under the hood will take you to 60 MPH in under 10 seconds, and you can go over 120 miles per hour. You can also fit a load of groceries in the trunk, and fighting urban potholes is not nearly as big of a deal during everyday driving as with other competitors. We found the full cloth seating (for four) to be very comfortable, supportive, and well-made. The radio only had one speaker, but played clearly enough. The 5-speed manual transmission was a joy to row in spirited driving, and its driving dynamics made doing donuts both easy and… well… smoky. All in good fun, of course. Its price is about in the middle of the pack, which makes it a viable alternative to a boring sedan for some folks, but it’s by no means a “budget” sports car. Still, we can’t overlook the overall package. And that’s why it’s our top pick this year. 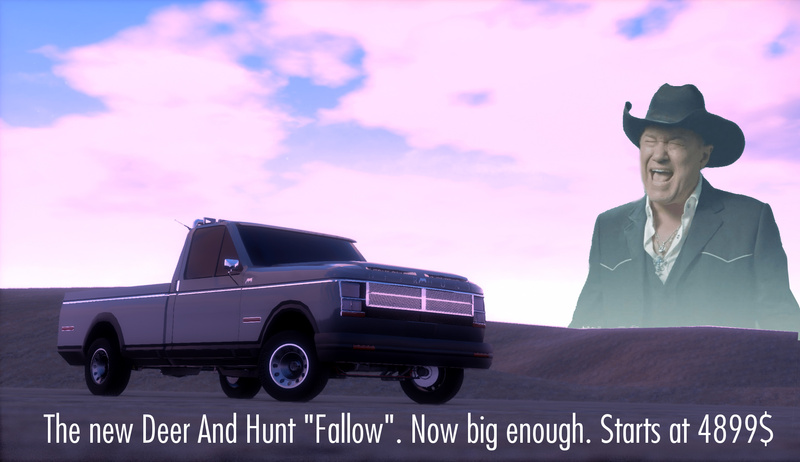 The stalwart truck of our roads, the D&H Fallow, tops our list in the utility field this year. With a no-nonsense 5.0 liter V8 engine, cargo and pulling power to spare, and newer interior refinements, this was not a particularly difficult decision to make. And, of course, over two million buyers have made that same decision since the Fallow was introduced over 30 years ago. You can’t argue with that kind of crowd, now, can you? Of the engines put before us this year, we are most impressed with the 1.7 liter 4-cylider from Cascadia. 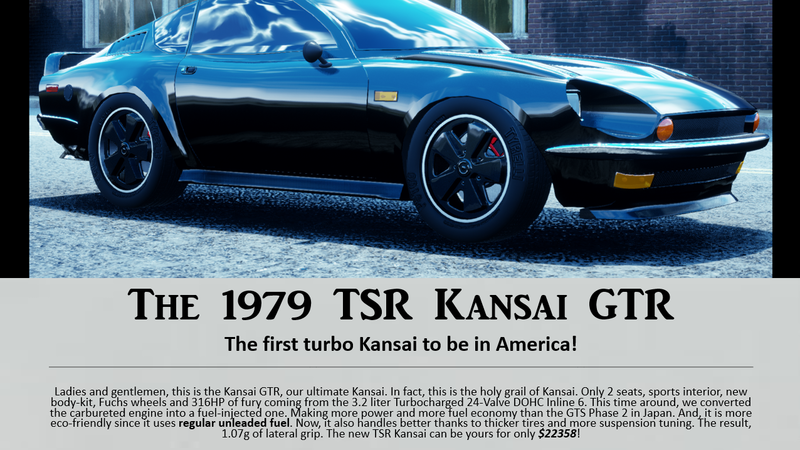 Just a decade ago, it would have been unthinkable that something that put out a mere 69 horsepower would ever make this list. But as times have changed, so have our criteria. Cascadia has put a slick throttle-body fuel injection on their little 1.7 liter, giving it incredible efficiency. Add to that reports from our testing labs that predict this motor to be long lived and you have a winning combination. Ronald Reagan elected president. US Rail industry is deregulated. STS launches begin. Iran-Iraq war. Massive inflation. John Lennon dies. Mt. St. Helens erupts. Bumpers: 5MPH bumpers. Most cars with “integrated” bumpers qualify. 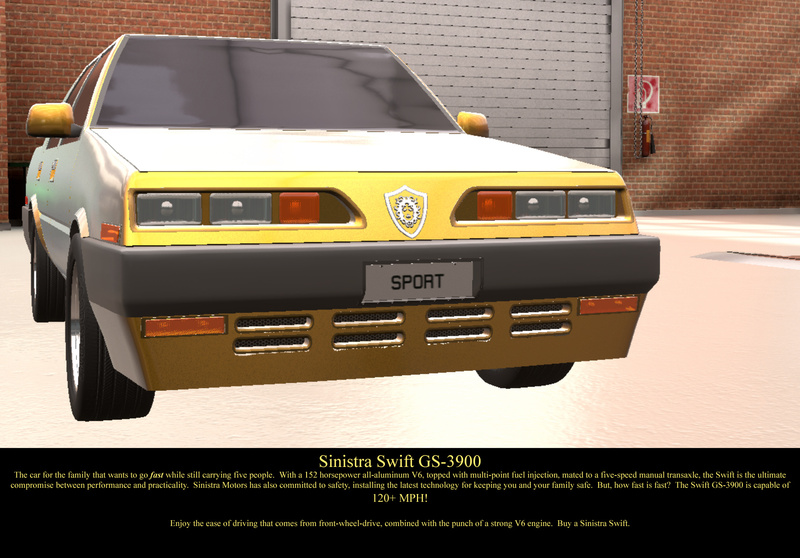 Cars with no discernable integrated bumper must have a bumper added. Rear lights: At least one pair of brake lights. At least one pair of turn signals. At least one pair of reverse lights. NO lights may be placed bumpers (however, optional red reflectors may be). If turn and brake lights are in the same fixture AND of the same color, there must be a minimum of THREE bulbs in the fixture. Safety: All passenger vehicles must have a minimum of 26 safety. All trucks, vans, and utes must have a minimum of 20 safety.